Did you know that cursive handwriting has been pushed out of the standard public elementary school curriculum? I’ve been involved in a couple online discussions about this, and I find that this is not a good thing. There are many benefits of cursive and in spite of keyboarding, I think that cursive is a valuable skill. 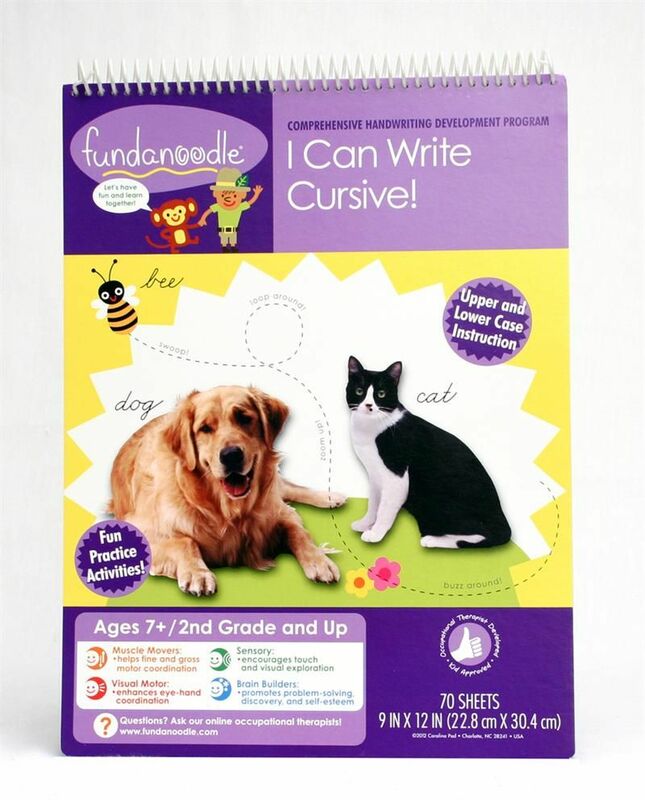 So do the people at Fundanoodle, who sent Levi and I their newest handwriting book, I Can Write Cursive ($8.99) for 2nd graders (ages 7+) to review. Educators and an occupational therapist developed this program to allow teachers to still teach cursive in a semi-independent way while integrating some of the facts necessary for Common Core alignment. As you can see, simpler shaped letters are taught before more complex ones. The first two pages are instructions for teacher/ parent to review grasping and positioning. 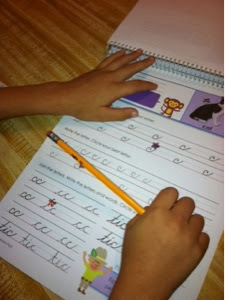 Students are guided by a monkey named Max who provides action cues on letter shape – things like “buzz around” or “swoop.” The next two pages help students begin to make the transition from reading print to reading cursive. Two more pages of simple one-line exercises help students “keep their pencil moving” in a series of repetitious movements. Here’s a blank page which is typical for lower and upper case practice Here is one of Levi’s completed pages. 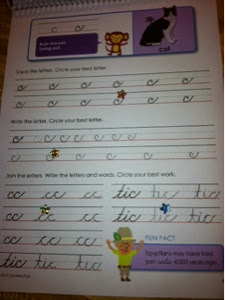 I like that the directions ask the student to evaluate their work and find their best letter. Levi likes to use stickers! After lower case letters are addressed, a page each for upper case letters is provided. These pages only have one line of letters for tracing, a blank line for forming capitals on his/her own, and a non-fiction factoid about history or science or geography for students to copy. The last few pages extend copywork into lists, such as days of the week or the names of planets, and recall of facts (like the names of the continents). My recommendations & thoughts: I’ll admit that this program did not excite Levi initially; He’s a slightly older 2nd grader (late birthday) and thought the monkey was silly. The hook for this program, however, is that it doesn’t take us too long to complete – may be 10 minutes per page – and he likes it when we try to spy out his best letter or word. Amazing that such a little thing like sticker could endear a whole writing program to Levi. And when you consider that you’ll get an entire cursive program for less than $9 – well, it is worth looking into. Fundanoodle has also produced a number of other preschool and early elementary books to help with basic motor skills and academics. Our Review Crew had the opportunity to review many of them. Click to read more reviews about Fundanoodle products from the Schoolhouse Review Crew.